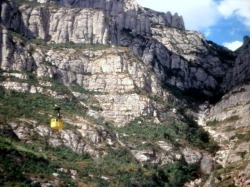 On the cable car up to Montserrat. Arose at 9, Dave with a slight sore throat. It rained last night – probably the first time here in a while. It’s quite brown and you can see the trees dying. Breakfast of eggs, etc., Jill oatmeal, Kristen nothing. We were on the way to Montserrat by 11. Took about an hour to get there on the same road we arrived from the airport on. 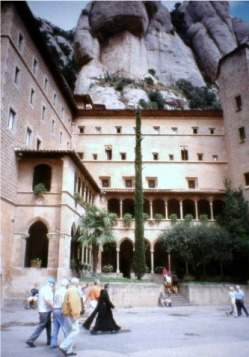 Montserrat just sort of juts out of the ground 2000 (?) feet in the air like a saw blade. There’s a monastery complex at the top with a “Black Virgin” statue many hundreds of years old. Touch it and you’re guaranteed children. We took a cable car up from the valley floor that was pretty spectacular. Kristen liked it. At the top we climbed another 250 steps to the basilica. The massive bell chimed at 12:50 – turned out it was for the Boys’ Choir, similar to the Vienna Boys Choir. We squeezed into the back of the church, which was packed. 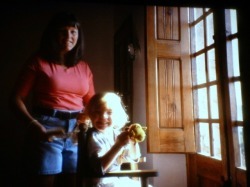 Jill and Kristen could not see, and left. I stayed for the 10 minute singing. Very nice but too crowded. After everyone vacated we went back into the church to look around. You could see the Black Virgin on a second story above the altar, with a line snaking to fondle her. The line was too long for non-Catholics who don’t want more kids, so we didn’t join in the fun. Found a large plastic playground for Kristen and I called Mom & Dad to check in. Had a very nice lunch at the Hotel Abat Cisneros - a good find. It was in our guidebook. Dave – salad and good paella, Jill bean salad and mixed vegetables. Kristen – pork, noodles with shrimp and French fries, from the Kids’ menu. We skipped coffee and dessert because it was already 3 p.m. Took the tram down, then drove back to the top, in order to follow the route in the book. Views were spectacular and sunlit. Once we were on our way down the other side we realized we would not be able to complete the route. Went to Igvalada, described in the book as a “leather town”. Must be where they make it, not sell it. Very large and industrial. By now we realized we were in jeopardy of not returning by 7. Took what looked like a shortcut on the map that ended up that ended up being a twisting, turning route that had gorgeous views of Montserrat in the distance. Finally got to Manresa, another very large town with lots of 6 p.m. traffic. Felt like I was back in New York. Finally cleared the traffic in about a half hour and had 45 minutes to get home. Pulled into the hotel parking lot at 6:59 and got home but no guests. It’s now 8:30 so I guess they came and went or never arrived. We’ll find out at dinner at 9:00. Well, about 5 minutes later Nuria arrived with her boys Jordi and Miguel (?). Ages 3 & 5. They brought some toys for Kristen, though they had asked “Why does she need toys when she has a ping pong table?” The boys were out of control; Jill said that if they were hers she’d be in an institution. Dinner of Veg and pork (Jill), octopus terrine and pork (peeg) (Dave). Enrique struggled with his English but it was all downhill after he drew us a picture of an octopus to illustrate one of the first courses.